The two bedroom pied à terre apartment is located in the Lincoln Center area of NYC. It was designed for a Client who shares her time between Los Angeles and New York. The foyer sets the tone which is present throughout the space. The contemporary abstract drawing by Morgan O’Hara represents movement of a dancer on the stage. 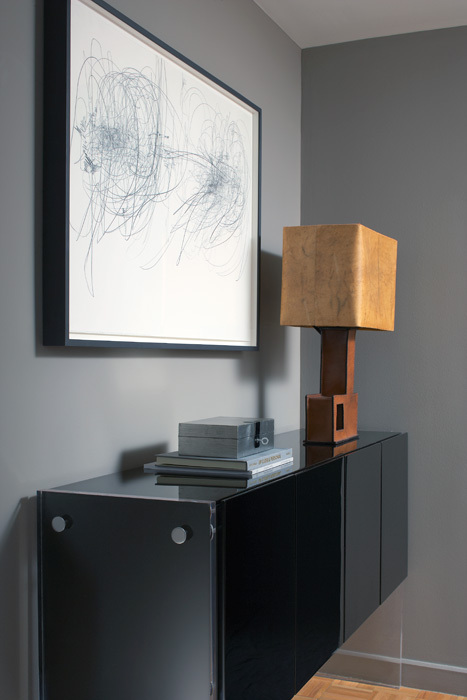 The black lacquer and Lucite mid-century console and table lamp are an introduction of what to expect in the rest of the space.